Mandriva 2011: Dusk or Dawn of Linux Legend? You can never tell what happens with yourself next. Did developers who started Mandrake project back in 1998 knew that their baby would become world famous operating system? But fate of this baby is not the easiest. It was renamed to Mandriva, remarketed, and finally split into at least two. I am talking about recent fork between Mandriva and Mageia. Of course, there were other forks before, but recent one was the most serious in the whole history. But Mandriva as a project still exists. To prove this fact, new version of Mandriva Linux was released with codename Mandriva 2011 Hydrogen. I have already written about Mandriva Linux several times. They were reviews of Mandriva 2010.1 and 2010.2, based on KDE. Up to that point Mandriva released different spins of their operating system: one CD iso image for GNOME and another for KDE version. Latest Hydrogen release is different here. It only has KDE version. Other DEs were deprecated, although still available from community. And new ISO image weights more than 1.6 Gb. This is significantly more than previous versions which could fit standard CD. By the way, for limited time only you can still get CD with previous version of Mandriva from Buy Linux CDs web shop! I was not much impressed with previous releases of Mandriva. But Mageia quickly became my distribution #1. That's why I was very curious how much Mageia 1 was different from Mandriva 2011. It was time for me to create Live USB for Mandriva. Previous versions of this OS had special tool called "Mandriva Seed" to create Live USB. This time round I decided to use something more generic. And I was lucky! My Live USB was created from iso image with simple dd command. Same method is mentioned in release notes, if you bother to read them. A browser is a software which is used to extract information from the World Wide Web. The World Wide Web is a large database containing information about everything in a uniform and organized way. To get the best out of your browser includes using up its different features, ensuring that it is secure, easy and simple to use. It is important to maximize the accessibility features. To optimize the use of your browser it is necessary to make sure that you are able to use all its features. This includes its spellcheck features, its search engine toolbar and its browser toolbar. It is also good to be familiar with its password, bookmark and download management features. The password management allows you to secure your identity. The bookmarker facilitates short cuts to favorites. Download managers view and download articles from a status bar. Spellcheck features give the ease of producing documents that are correct. To get the best from your browser you should be familiar with the page zooming, the spatial navigation, the tabbed browser and the full text search. The status bar should always be visible and one should be able to know when a website is still been loaded. One should be able to open a link in a new tab and keep both pages open in the web browser. Multiply web pages are created when one does tabbed browsing. The Firefox toolbar can be customized. This can be done by adding, removing or rearranging items on the toolbar. You can basically revamp your browser moving things around and using functions of add-ons. For example, look at the article which shows how you can make Firefox to look like Chrome. It is important to remove unwanted files from the cache.This will speed up the rate of accessing information.You will also be able to download faster. It is vital to be familiar with the buttons about how to access information from the past and how to use the forward buttons. The reload button reloads current information and the stop button cancels the loading of resources. The address bar shows the current address that the user is in or the prompt for the address which the user intends to go to. The search bar in found in the top right hand of the Firefox browser.You can use Firefox toolbar to search most search engines. The status bar is the box at the bottom of the browser. It shows the status of the website being loaded in a window. The best use of a browser comes with practice of all its features, exploring its automatic updates, a good internet connection, customizing features that we want to add-on. This makes the browser fully functional and provides good performance. It is interesting to use a browser that you are familiar with. Reese Weller provides an assortment of article services pertaining to firefox toolbars and browser toolbar. This is guest post by Reese Weller. Author's view can differ from site owner's. GhostBSD: not "just another BSD"
This article continues series of reviews of non-Linux operating systems which you can find existing. Another big family of OSes is based on BSD core. PCBSD, BSDanywhere, FreeSBIE... you can read more about them. It's time to start our today's adventure. GhostBSD is GNOME implementation in FreeBSD system. Latest version is 2.0. It was released at the end of March 2011. This version is based on FreeBSD 8.2. ISO image size of this OS distribution weights 1.1 Gb. Quite a lot as I need to note. Forum, Documentation and FAQ sections are pretty much empty on official site. I have not found any information about LiveUSB creation process for GhostBSD in the Internet either. Finally, I decided to look at DVD-RW option. This means the test could only be carried out on Toshiba L500 laptop. Expectedly, it would be a hard task for BSD since not every Linux distribution worked fine on that laptop so far. This laptop has Realtek 8191 WiFi card which is not the most popular among free open source software developers. But let's talk about this later. To give the GhostBSD more chances, I also tried same DVD-RW on the HP Compaq 6710b laptop which has Intel 3945ABG wireless card. Anyway, DVD-RW is ready. Reboot. Choose to boot from DVD. Let's go! My second advent into world of Linux happened somewhere in September 2010. It was so much unusual experience for me that I decided to put my thoughts and feeling into this blog. What was in the beginning? No, it was not Word. It was SLAX. SLAX OS is pocket oriented Linux distribution based on Slackware. That's why my first post in this blog is named "How to put a system in a pocket". SLAX itself is very user-friendly and easy for beginners. I must admit, I was lucky enough to start from SLAX. But today I will not talk about SLAX. And I will not talk about Slackware. I will talk about older brother of SLAX - Salix OS. Salix OS is not intended to be "pocket size" OS. But, as I will tell you in next few paragraphs, it can be put into the pocket. But first of all, let me introduce Salix OS. 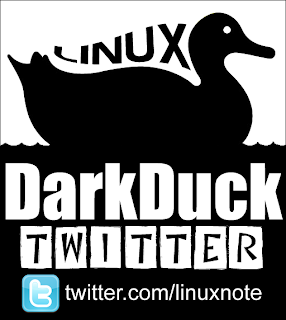 It is Linux distribution based on Slackware and intended to be "simple, fast and easy to use". It is released in 4 options: KDE, XFCE, LXDE and Fluxbox. 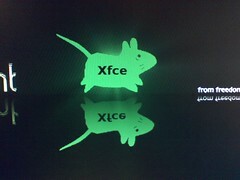 I am great fan of KDE, but because I am currently interested in replacement for Linux Mint XFCE, my choice this time was for XFCE edition. Unfortunately, Live version of Salix XFCE is only available for version 13.1.2 (released in November 2010), whereas installation version has been already upgraded to 13.37 (released in May 2011). Did this stop me? Of course not! So, ISO image of Salix OS 13.1.2 XFCE is downloaded and ready to use. What is surprisingly interesting, process of creation of Live USB is described in Salix Startup Guide. All you need to do is to copy files from ISO into USB root folder and run a script. Where have I seen similar before? Yes, it is the same approach as SLAX uses. Unfortunately, this process did not work for me, because Live USB creator script requires 63 sectors for MBR and my USB stick only had 62. No problem, Live CD is still an option and CD-RW was burnt using same ISO image. CD-RW is in the optical drive of my Compaq C300 laptop. Reboot. Choose to boot from CD. Let's go! On April the 21st Feedburner showed me number of subscriber over 100. 4 months passed by. And here it is. Another milestone has been passed. Today Feedburner counter hit another round value - 200. To be precise, total number of subscribers now is 206. Do you want to join ? There is a link to RSS feed on the right. 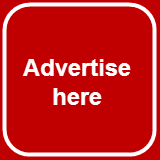 Just below you can subscribe via e-mail. And, of course, Twitter and Facebook options are still available. All these subscriptions will cost you nothing. They are FREE! And to give you another reason to subscribe, I can tell you that I have recently found a operating system which is good enough to replace my existing Mint XFCE when I replace my laptop. To give you some clues, it is based on the same distribution as the first distribution I have ever blogged about. And it has XFCE version. I will write more in the next few days. Any ideas what it is? Please put in the comments. The subscriber (it should be e-mail subscriber!) and commenter who guesses correct name of distribution will get special prize. Windows is by far the most commonly used operating system, with over 95% market share. Most computer users have used Windows operating systems exclusively throughout their lives, and may know very little about alternatives. The next biggest operating system is Apple's OS X. One of the main differences between Windows and Apple is that Windows can be put and run on just about any computer, while the Apple operating system can only be run on Apple hardware. This means if you want to switch to the Apple OS, you have to buy an Apple computer. 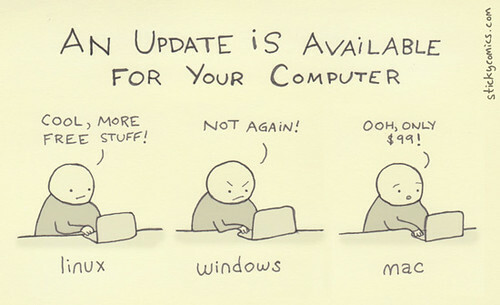 The second most popular alternative to Windows is Linux. Linux is a free, open source operating system which can run on any system. It is redistributed in a number of different forms, the most common being the Ubuntu distribution. Linux has a comparatively small user base, and it has traditionally been considered difficult to use, however it has gotten better over time, and is fairly easy to install. Linux is supported by a large developer community, and it isn't hard to find help when you need it. Over the recent decade or so, there has been some convergence of the operating system market. Several years ago, the three major operating systems - Windows, Mac, and Linux, were all very different, and had very steep learning curves. The modern versions, however, are relatively similar, and aren't nearly as hard to switch between. This is mostly a product of the Windows-ification of Mac and Linux, but Windows has also adopted some of the features of Mac in their latest iteration, Windows 7. There is considerable documentation available for users who are switching between any operating system, and you can find lots great online articles, published books, and in-depth tutorials. For switching from Windows to the Mac, you can buy a support plan from Apple which allows you to go in to their stores several times and get training sessions from their experienced employees. This is an especially good for less technically-savvy users. Because Linux is open source and community, there isn't specifically anyone to go to for help. Ubuntu does offer tech support for a fee, which is one option to consider. They also have a very active developer community which participate in online forums, and you can get lots of help by asking questions there. 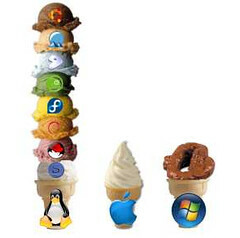 If you have decided to give Linux a try, there is a big choice of distributions available. Ubuntu which was mentioned above is most popular, but not the only. This blog is dedicated to reviews of different Linux distributions and can help you to navigate in the world of Linux. When you decided which distribution to try, you can either download it for free and burn onto CD yourself, or you can also buy Linux CD from dedicated site. And CD will be dispatched to you wherever in the world you live. Windows is by far the most used operating system, and for many people it works just fine. However, it is not necessarily the best, and you may find that you benefit from going to another operating system. Miles Walker writes about getting the best car insurance quote over at Car Insurance Comparison .org. His recent review looked at Kentucky car insurance. Linux world is not alone here. So many battles happened in discussions what is the best distribution. I expected another episode of the battle when published post "What is your best favourite KDE distro?". That post quickly became branch of PCLinuxOS forum: so many PCLOS users took part in commenting. But that's human nature: we are so lazy to write sometimes... To give users of other distributions equal right and not to bother them too much, I opened voting on this blog, where users were not required to write anything unless they wanted to. Instead, there was drop-down menu with list of different KDE-based distributions. Voting was opened 9 days ago and planned to be closed on 20th of August. It is now time to announce results. I must admit, results are not exactly what I expected. But they reflect true situation on the KDE "market", I can't object. My relationships with Linux Mint have never been stable. I don't like Mint versions based on KDE or GNOME with Ubuntu underneath. Basically because Mint menu is not good for me. And Mint KDE is just spoiled version of Kubuntu. That's my personal opinion. But at the same time I like Mint XFCE based on Debian. It's not the love which lasts. It is love which comes and leaves from time to time. My first acquittance with Linux Mint XFCE made me to adore it. Then I had some rollercoaster with it. But feelings were still strong, and I decided to let Linux Mint XFCE to live on my hard drive. It is now installed as part of my 4-system lanscape. To be honest, I have not booted Linux Mint for couple of weeks, maybe more. Different reasons, but mostly because I was not around my laptop for some time. Today I decided to give Mint a chance to update itself. It's based on Debian Testing which makes it constantly rolling. Once upon a time God gathered all the animals in one place and commanded: clever ones should go to the left, beautiful ones should go to the right. All the animals made their choice. And only a monkey stayed in the middle. She could not tear herself into 2 parts. Do you often face similar situation, when both options are tempting, but you only can choose one of them? Browser market has lots of options really. Konqueror, Rekonk, eLinks, Midori, Safari, Opera. They have their own market share, but they are not leaders. Who are? These 3 browsers are used by visitors generating about 85% of all traffic to this blog. Even though Microsoft Internet Explorer is still used by visitors, it does not belong to the category of free open source software. Purists can object that Chrome is also not FOSS. But Chromium is, and everything what works in Chromium also works in Chrome (but not vice versa). So, we left with Firefox and Chrome(-ium) options. They are 2 different browsers, based on 2 different rendering engines, developed by different teams. But what to they have in common? They are both created for Internet browsing. Can we make them look similar? Yes, we can. Let's chromisize Firefox and make it Chromofox! Nothing is stationary in our world. Everything flows and changes. You can never predict what happens next. I have already reviewed OpenSuSE 11.4. That was review of GNOME version in Live run. I was not much happy about this system. That time I decided myself: enough for OpenSuSE until next release. Live run is not decisive for system selection. I wrote about this point already, and won't repeat my reasons again. GNOME implementation in SuSE s***cks and I should try KDE version. Maybe, but... GNOME is still a version available for everyone, why shouldn't I review it? If you read my blog from time to time, you should be aware that I also run site buylinuxcds.co.uk, which is commercial part of this blog. You can order your own CD with Linux there. But I also put my items on eBay site sometimes. This time surprise came from that direction. A person bought a CD on eBay asking me to ship OpenSuSE 11.4 with KDE desktop environment. Could I miss such an opportunity to peek and create my own opinion? Of course not! Moreover, I have to test the disk before handing it down to buyer. So, CD is recorded. It is in the CD-ROM of my Compaq C300 laptop. Reboot. Choose to boot from optical drive. Let's go! Vote for your best favourite KDE distro! Voting is now closed. Please review results. I have posted recently my opinion about best favourite KDE distro. There was a storm of comments, as you can see it yourself. But we are humans... and sometimes we are lazy. That's why I decided to create another post for similar topic, and this time with small poll. You don't need to write a comment - just select your favourite KDE distro, add comments if you like and send me a confirmation. I'll pick up responses and publish results somewhere around 20th of August. I have already written about BSD-based systems several times. I reviewed FreeSBIE and PCBSD. They were system based on XFCE and KDE. These are more or less modern looking operating systems. Could I imaging myself back into 1990s when I was downloading another BSD-based system? This time I will tell you about BSDanywhere. This is Live CD based on OpenBSD. Authors write on their site that this OS is not intended to be installed at all, and that it only works from CD. That is fine, because I was interested in Live systems from the very beginning. Latest version of BSDanywhere has number 4.6 and was released in November 2009. Unfortunately, it is the last version because its single developer stopped any further activities with BSDanywhere and switched to OpenBSD itself. So, iso image of BSDanywhere is downloaded and burnt onto CD-RW. Disk is in the optical drive of my Compaq C300 laptop. Reboot. Choose to boot from CD-RW. Let's go! PC and mobile users often need video conversion tools because of the restrictions placed on various devices. While one device may play H.264 perfectly well, another may insist on MPEG2. These limitations are not insurmountable. With the proper video conversion tools, you can make videos that play everywhere from YouTube to your Blu-ray player. Aptosid 2011-02: is it any good? Aptosid is Debian-based Linux distribution aiming desktops of users wishing to live on cutting edge of technology. It is based on Debian Sid, which is unstable branch. Sid is kind of sandbox where developers can test their ideas before they are moved to Testing and eventually to Stable releases. It means that while Debian as whole is considered by many as rock-solid system, Sid should never be considered as such. And this is a platform for Aptosid. I have looked at Aptosid already, that was Aptosid version 2011-01. I was quite impressed that time, even though there were some issues which were show-stoppers for me. July saw release of new Aptosid version, this time 2011-02. It was released on 13th of July. Even though it was not Friday, but still 13th. Was it bad day for Aptosid? Let's have a look. Aptosid allows you to choose several options: XFCE, KDE-full and KDE-lite. My choice, as in previous time, was for KDE-lite version which fits CD. Eventually CD-RW disk was burnt and Compaq C300 laptop prepared for a test. By the way... If you want to get your own CD with Aptosid (or many other distributions), why not order them at Buy Linux CDs site? Reboot. Choose to boot from CD. Let's go! Seems like just yesterday I ran a contest trying to figure out who can see 100,000 on the visitors' counter on this blog. I'd like to say THANK YOU to all the readers and subscribers of this blog! Hope you find it enjoyable and useful. If you follow this blog for some time, you should have noticed that I make guest postings from time to time on selected resources. Today my guest post was published at Wazi. Please follow the link to learn How To Create an Ebook with OpenOffice.org.